1. Using a lip balm as based. 2. Wait 3-5 minutes after apply the item. 3. Due to the item is waterproof and long lasting, must use lip makeup remover to remove all make up. 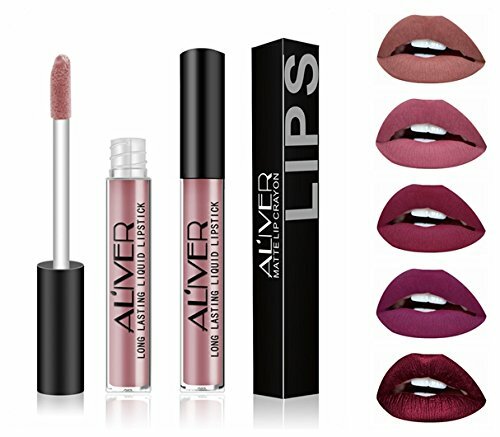 AL'IVER is a Beauty supplier from Shenzhen, China. Sincerely hope to provide an wonderful feeling for you at AL'IVER Beauty! ❤Rich rosewood liquid lipstick goes on like a lip gloss and dries to matte finish about 2-3 minutes after application.This formula features a light-weight formula that gives a matte lip that lasts for hours. ❤Directions for use: DIRECTION FOR USE: Exfoliate lips before use. Contour with a lip liner that the same color with lipstick. It will be dry in a 2-3 minutes. Avoid oily foods. ❤PLEASE NOTE: All photos shown are of our lip products. Color may vary slightly depending on your skin and lip shade and/or your monitor's color setting. ❤SENSITIVE SKIN ATTENTION: AL'IVER is responsible for all the products we sold, but effect varied from different person's skin. Stop using if any abnormal reaction happened and contact us. If you have any questions about this product by AL'IVER, contact us by completing and submitting the form below. If you are looking for a specif part number, please include it with your message.